In the arch above the portal of Santa Maria Maggiore, the great basilica church in Rome, there must have been an artwork or symbolic representation of some sort shortly after it was built, early in the fifth century. We cannot be certain now what it was, but had the structure been used as a Roman court (it so closely resembles one that it has sometimes been thought [wrongly] to be a converted imperial edifice), the symbol in that location would likely have been the sol invictus, the unconquered sun, an emblem of the Roman emperors. 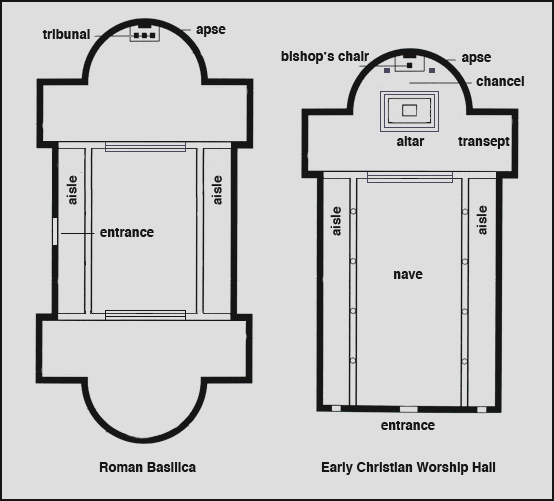 Christian basilica churches are very similar in lay-out to the Roman basilicas (see below), so that they can be viewed as an architectural juxtaposition of the old order of Roman justice and the New Law of grace and mercy in Christ. The angels most probably represent the “four daughters of God,” Justice and Truth with their drawn swords, and above them Grace and Peace (cf. Ps. 84:10; Vulgate 84:11). The text of Scripture Christ holds open is from John 8:12 which in Latin reads “Ego sum lux mundi, qui….” The reader has to supply the rest from memory, as space in a mosaic is limited. Of course, recollection causes more than five words to be remembered: “qui sequitur me, non ambulat in tenebris, sed habebit lumen vitae” – “I am the light of the world; whoever follows me will not walk in darkness, but will have the light of life” (ESV). For Roman Christians the old darkness was fresh enough in cultural memory and its contrast with the light of Christ striking. In the season of Advent the promise of that light out of darkness, unconquered, is still welcome, and still an invitation to worship. 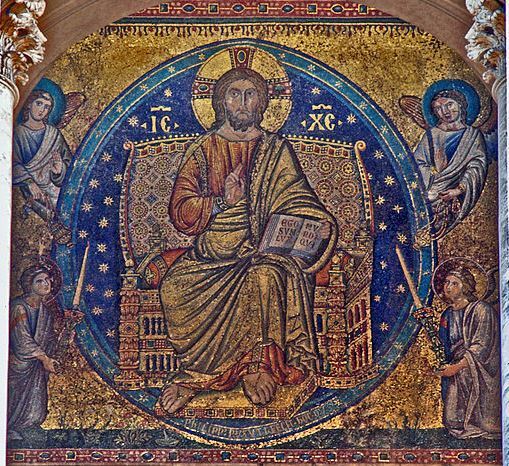 Filippo Rusuti: Ego sum Lux Mundi, 1288-1297, mosaic, Santa Maria Maggiore, Rome, Italy. Filippo Rusuti (c. 1255–c. 1325) was an Italian painter, active in Rome between 1288 and 1297, and in Naples around 1320. This is his only signed work. David Lyle Jeffrey is Distinguished Professor of Literature and the Humanities at Baylor University. He is the author of a forthcoming book, The Beauty of Holiness: Art and the Bible in Christian Culture (Eerdmans, 2017).